As others have done, my design L.O.G. Sous Vide uses a simple crock pot as the heating element. It has to be simple as the temperature is controlled by controlling the AC going to it. Basic Theory: A temperature sensor is connected to the Arduino. The temperature sensor is placed in the crock pot submersed in water along with the food to be cooked. Two pushbuttons on the Arduino set the desired temperature. If the water temperature is below the set temperature, the SSR is turned on so AC is supplied to the crock pot and the water heats up. When the water temperature reaches the set temperature, the SSR turns off and the crock pot stops heating. Thus the water temperature stays at the set temperature. I purchased most everything off of ebay and at my local hardware store. The crock pot is borrowed. So you may ask, why did I select the DS18B20 for the temperature probe? There are many devices that are a lot cheaper. The main reason is because they’re pre-calibrated. They are accurate to within ½ a degree C.
On ebay, the DS18B20 comes in two types: one is the TO-92 three lead package. The second is the waterproof type shown in the picture. I have some of the TO-92 types and was thinking about making my own waterproof submersible one but I was feeling Lazy so I bought the waterproof version. The primary reason I selected the DS18B20 is the accuracy. It is calibrated to +/- 0.5C. Most of the other cheap temperature sensors have to (or should be) calibrated at various temperature points to achieve better accuracy. Irrelevant Information: Calibration: A typical two point calibration is to use freezing temperature of water, 32F (0C)and boiling point of water, 212F (100C). But wait! This boiling point is only true at sea level. My altitude is about 4600 ft. so boiling water is about 203F. Okay, this is a lot of work and I’m LAZY so I will just assume that the DS18B20 is as accurate as claimed. Secondary reason: the DS18B20 is digital as opposed to analog. Analog sensor accuracy varies with associated components and noise. Digital data is not subject to any of that. Technobabble: The DS18B20 data is transferred serially, specifically SPI (Serial Peripheral Interface). But serial is digital. Simply speaking, there are two versions of digital data, serial and parallel. Third reason: This one only a Geek can love. The DS18B20 uses something called a 1-wire buss. In theory what this means is that you only need one wire to connect the DS18B20 to the receiver (Arduino, in this case). In practice you need two wires as the circuit needs a ground. And full disclosure, I’m using three. I am also using the Dallas Temperature library. I think the only thing I’m using it for is the conversion of Centigrade to Fahrenheit, which I could’ve written myself. However, there’s a lot of other things you can do with this library. WARNING: Some of these waterproof DS18B20 ebay listings show the color code of the wires. Mine did but the code was wrong. Since I had a TO92 version, I used an ohmmeter to compare. Red was 5V, Green was signal and Yellow was ground. You may have different results. Instead of using a standard Arduino and shield, I decided to build my own Arduino on a PCB. There is a USB_BUB type connector like the one on a RBBB. There’s places for connectors for 5Vdc, SSR and DS18B20 temperatrue probe. This is a single sided PCB, so it’s easier for the DIYer to make. Because of this plus some space considerations, there are some unique problems. 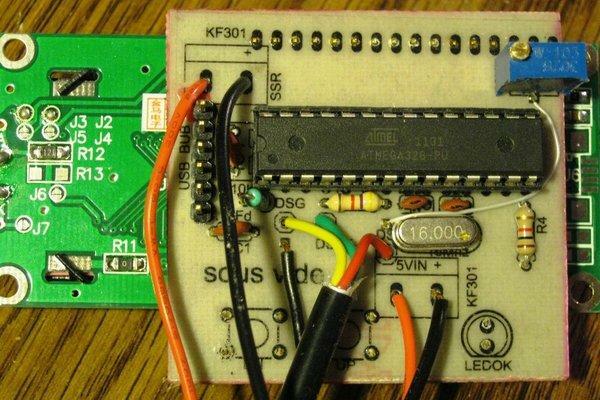 The Eagle Cadsoft schematic and PCB files are included. The LCD1602 is attached to the back of this PCB. 1. The jumpers and all components except the pushbuttons and LED are soldered onto the component side. 2. The wires for the 5V-Gnd, SSR and DS18B20 come out the component side and are soldered to the solder side. 3. 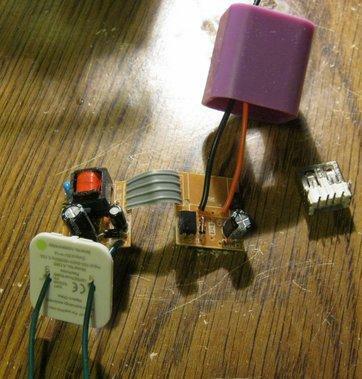 The pushbuttons and LED are inserted on the solder side. The LED is not inserted flush so that it sticks out and is easier to solder. 4. Male header pins are put in the solder side of the PCB and carefully soldered. 5. The LCD1602 is inserted onto the header pins and soldered. The schematic is attached. 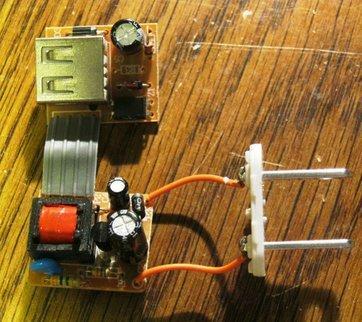 U$2 is for 5V in from USB power supply. 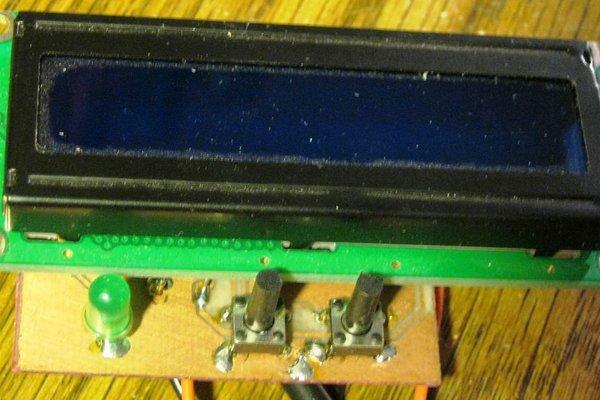 The 10K potentiometer adjusts contrast on the LCD1602. 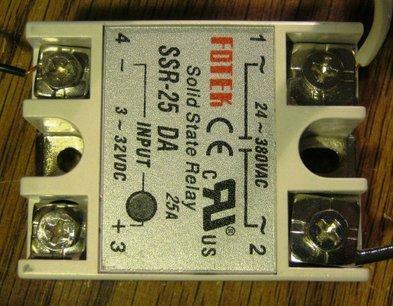 The SSR connector goes to the SSR25DA (polarity is important) The DSx connections go to the DS18B20 temperature sensor. I’ve included the Eagle Cadsoft files if you want to make your own PCB. Each DS18B20 sensor has a unique address. You need to know that address so that you can talk to it. I would recommend that you test each DS18B20 on a breadboard and get its address before hand. If you haven’t done this or can’t remember, here’s a way to find it after it’s already installed on one of these PCBs.Connect the sous vide PCB to your PC with a USB adapter. I use a PL2303 module but you can also use a USB-BUB. Upload the program to the Arduino. Open your Serial Monitor and set for 9600 baud. You should see something like the picture. When you exit the environment, you don’t need to save the changes. I did some minor modifications to the USB power supply to make it easier to fit in the box. First test it to make sure it works. One of mine didn’t work. I have phones and tablets that are charged with USB. 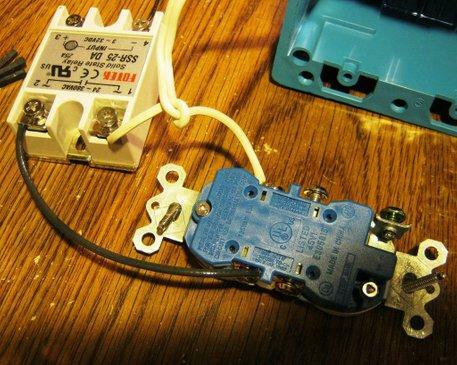 The AC connector plate can be removed with a little prying. I used a utility knife. The next picture shows what’s inside. You need the OneWire and DallasTemperature libraries. You must change the following line to the address you recorded. I set the minimum temperature to 43C and the maximum to 84C. You can change these. The sketch can be loaded with just the USB_BUB adapter for power. The display shows the Set temperature in Fahrenheit and Centigrade on the first line. The second line shows the DS18B20 temperature. The set temperature can be adjusted with the up and down buttons. If the probe temperature is less than the set temp, the LED will be off and the SSR on(heating the crock pot). When the probe gets up to within 2C of the set, the LED will slowly blink. When it gets to the set temperature it will be on steady. Technobabble: I added a little hysteresis so the temperature shouldn’t overshoot the set temp by very much. I used a double AC outlet box for convenience and safety. The wiring diagram shows how everything is wired together. For US users, the AC pin that’s shorter is the ‘hot’ side and is the one that should be switched.I used an old AC plug for the power connector.The double outlet cover had to be modified to fit the LCD1602 and mounting holes. Assembly: The SSR25DA goes on the bottom of one side with the AC outlet above it. My SSR25DA came with a cover to help insulate it. The USB power supply goes in the bottom of the other side with the PCB assembly above it. The DS18B20 also exits the bottom of the box. NOTE: I used too heavy a gauge wire. This made it very cumbersome to get it all crammed in there. Something like 22 gauge wire would be fine for the 5V and the SSR. WARNING:As pointed out by a reader. Solder is not good for human consumption. 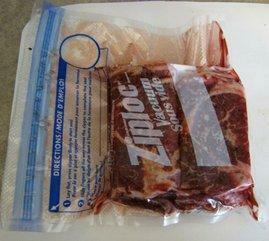 The vacuum sealed bag will prevent contamination unless it leaks. And the latest is that copper maybe be bad for people also. This is a warning for the wire rack. I made a little wire rack to suspend the DS18B20 probe in the water so it wouldn’t be touching the crock pot or the food packet. I used AC copper wiring and soldered connections.Suggestion: Warm the water up to set temperature before adding food.Plug the crock pot into the sous vide outlet box. Put the DS18B20 into the wire rack. I used a tie wrap to hold it in place. Put the rack into the crock pot. Plug the outlet box into AC. Turn the crock pot to High or On. Wait for the water to reach set temp. 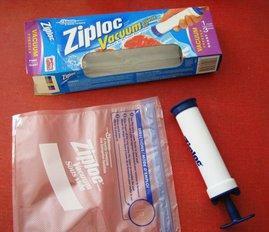 (I have a couple of IR thermometers and verified that the set temperature was what it was supposed to be)I bought a ZipLoc vacuum starter kit. Put the food in the bag. While expelling most of the air, close the top seal very tightly. Put the vacuum pump over the round spot. When the sous vide reaches set temp, place the food in the crock pot. I placed a dish over it to help hold it under water. This pieces of roast took about 15 minutes to get back to set temperature. Once set temperature is reached, you can set the crock pot to low. I don’t think it’ll make much difference. Cook the food for an adequate amount of time. Since I forgot about it, It cooked for 30 hours. The meat was supertender. I ate it with a fork. One of the nice things about sous vide is that ‘cooking’ time is not really critical. It’s great for an OLD Geek.